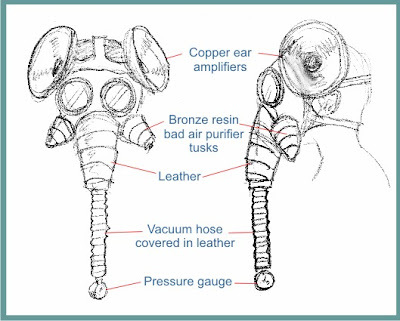 Here is my concept of the pachyderm gas mask. I have most of the leather parts handstitched together. I'm still working on the copper ears and the eyes. And I'm waiting for my pressure gauges to arrive. I've dyed the leather dark brown, antiqued to look like an old bomber jacket. This is going to be incredible, I can't wait! !